12 classic melodies expertly arranged for the acoustic guitarist: Ain't Misbehavin' • Angel Eyes • Body and Soul • Brother, Can You Spare a Dime? • Come Sunday • Georgia on My Mind • Here's That Rainy Day • I Left My Heart in San Francisco • In the Mood • Misty • Swinging on a Star • Take the “A” Train. 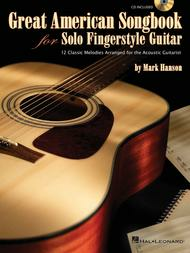 Grammy Award-winner Mark Hanson is a world-renowned acoustic guitarist, as well as performer, composer, recording artist, and author. The accompanying, hour-long CD includes short full-tempo performances of the arrangements, plus instruction and slow-tempo examples by Hanson himself!